WELCOME TO TRUE FLORIDA LIVING!This 3/2 CBS home is a jewel in the heart of Stuart and just 5 minutes to the beach or shopping downtown and schools close by. 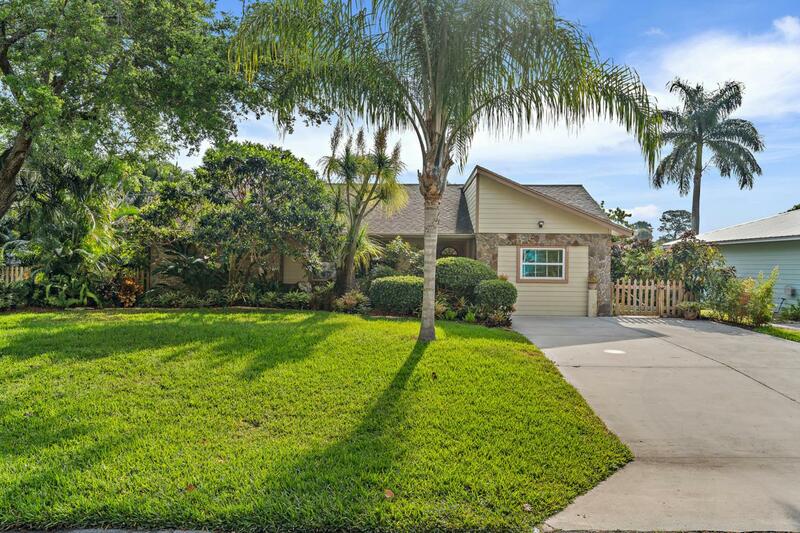 With lush tropical native landscaping, fenced yard, avocado and mango trees, it sits with tranquil views of Lake Charlotte which can be enjoyed while sitting on the covered lanai and screened patio or in the heated jacuzzi spa.Large master bedroom has a very nice walk-in closet and adjoining master bath. French doors lead out to the lanai and spa area. Second bedroom has sliding doors that also lead out to the same area. It has a walk-in closet as well. Third bedroom is now being used as a family/guest room. There is a very large laundry/utility room with built-in cabinets and pull down attic stairs.This home has a warm and inviting kitchen with 2 pantries and adjoining dining area and another space for office or breakfast nook. There is a large shed in the backyard and o the north side is a fenced area where a car or boat could be parked. There are many other features such as insulated windows for low electric bills and so much more. Listing provided courtesy of A&A International Realty Group.